With the official start of spring just a month away, it’s time to start thinking about spring lawn care and landscaping ideas. To truly get the most out of your lawn in the summer, it is necessary to hit the ground running in the spring—and by hit the ground running, we mean taking care of spring clean up, lawn prep, and landscape planning. 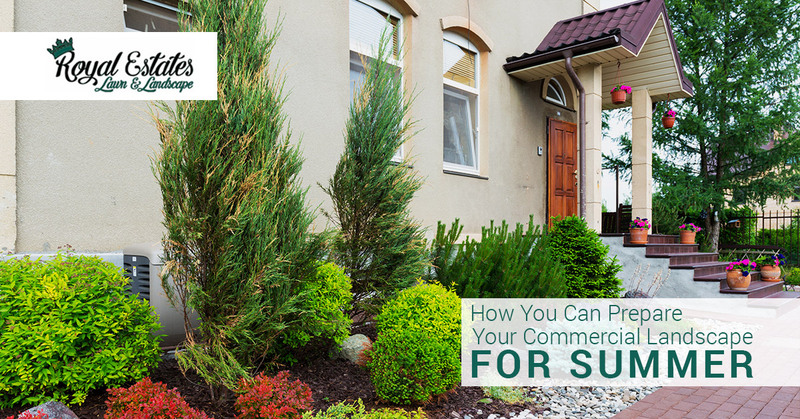 In today’s blog, we here at Royal Estates Lawn & Landscape would like to share with you some tips and ideas for improving your commercial landscaping this spring. Whether you are in need of commercial or residential landscaping or lawn care services, we are more than ready to help. We take great pride in every job that we are hired to do. Learn more about us, our lawn services, specials, and call us at (225)-372-7937 to get your free quote! Below are some things to do in the spring to prepare your commercial landscape for summer. Although the winters here in southern Louisiana aren’t as grey and cold as up north, they still leave us craving the bright vibrance of spring. Satisfy this craving by adding some bright flowers to your flower bed. Sprucing up your flower beds with flowers will not only improve curb appeal, but the splendor will last through summer. Additionally, there is also the option of adding some perennials to your bed. This is a budget-friendly option that will give you the benefit of having beautiful blooms that persist and return year after year. To find out what annuals or perennials would best match your commercial landscape, consult with your local landscaping company. Spring soil temperature is perfect for planting trees and shrubs on your commercial property. The cooler soil is loaded with moisture, creating the perfect condition for a young tree or shrub. Then, once summer’s heat rolls in, the plant and shrub will be rooted and ready to make the most out of the summer heat and sunlight, and also make them more resilient to pests, drought, and other summer hardships. During this time, it is important to become even more diligent with watering since the soil will be drier. Irrigation problems have a way of revealing themselves at the wrong time—like after a whole spring’s usage and the water bill arrives. Avoid this costly way of discovering irrigation problems by giving your system a thorough inspection before it gets put into full use. Broken spray heads, leaks, and breaks can happen quite easily. To ensure that your irrigation system is free of damage and running optimally, contact your local landscapers. They can not only provide a thorough inspection, but they can also work with you to develop a watering schedule that ensures your landscape is being watered in the most efficient way possible. While we are on the topic of irrigation and water, we should mention the importance of making sure your landscape and property is equipped with a proper drainage system. Have you noticed areas of pooling? Or areas where erosion is starting to occur because of water run-off? If you have, it is important to address these problems before they become bigger problems (i.e. more expensive problems). Whether you need to map out a better stormwater management system or find a way to properly deal with one part of your landscape that is pooling water, professional landscapers can work with you to devise a plan and put that plan in place before summer arrives. Although some may think it is a bit premature to discuss summer landscaping and lawn care plans, in this line of work it most certainly isn’t. Lawn care and landscaping changes often take time, and to ensure that you get the most out of your landscaping, preparation is key. If you would like to discuss the needs of your commercial property with professional landscapers, we encourage you to call us today. From preparing a commercial landscape design to devising a routine lawn care plan, Royal Estates Lawn & Landscape can handle your lawn and landscaping needs. Learn more about our landscaping company, our lawn and landscaping services, seasonal specials, and call us at (225)-372-7937 to get your free quote! Landscaping — Where To Start?